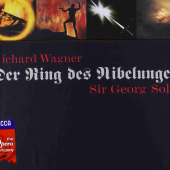 Few would have been surprised when Solti’s Decca recording of Richard Wagner’s The Ring of the Nibelung was voted The Recording of the Century: there was simply nothing which came within a bull’s roar. The entire seven-year project (1958-1965) was a miracle not just of great casting, singing, conducting and orchestral playing; it was equally epic in its organisation, logistics, budgetary discipline and technical innovation. The world of recording was never the quite the same. It changed the way people heard opera in their living rooms. as feathers in his cap, was a completely unknown quantity in an undertaking as mammoth as this, by far the largest, most ambitious and genuinely visionary recording ever attempted. the drama”. Decca’s Sonicstage recording process did usher in a golden age which became a benchmark for operatic and orchestral performances. The idea was to make the listener feel enveloped by the music in an even more dramatic way than if he (and, in those far off days, the consumer was always referred to as “he”) were seated in the most expensive seats in an opera house. Culshaw strove for authenticity in every bar, with “special effects” such as anvils, gold bars and thunder. Curiously, what were considered daring innovations then are now regarded as the least important or memorable features of the undertaking. Solti’s conducting was a complete contrast to the spiritual musings of Wilhelm Furtwängler and the rock-solid steadiness of Knappertsbusch: it was dynamic and explosive (sometimes to the point of brashness) but not lacking in subtlety or insight. of luxury casting, with small but crucial roles of Gunther sung by Dietrich Fischer-Dieskau and the even smaller role of the Woodbird sung by Joan Sutherland. score illustrations, Culshaw’s extended reminiscences with photographs, a supplementary booklet of (mostly) ecstatic Gramophone reviews, Deryck Cooke’s introduction printed in full, Humphrey Burton’s “making of” BBC film, and various other goodies included. It’s the most gorgeous thing, even though it’s not exactly a bargain, and it’s never sounded better either. It has been 51 years since the completion in 1964 of the first-ever recorded Ring cycle. Listening again to that first recording, I marvel at its existence. The complete Ring had never before been recorded because it was an enormously expensive undertaking and there was no reason to believe it would sell in sufficient numbers to cover the cost, let alone make a profit. Somehow, British recording producer John Culshaw (1924-80) convinced Decca management that the time was ripe for that recording, and that he was the man to head the project, as conducted by Georg Solti. In the end, the recordings did make money, and artistically they still stand as the version of the Ring by which all others are judged. This latest re-mastering of the Culshaw-Solti Ring provides an opportunity for a new generation of music-lovers to become acquainted with this celebrated recording. I last commented on this recording of the Ring in a long chapter in the revised version of my book Sir Georg Solti: His Life and Music. At that time, I expressed reservations about Solti’s conducting, suggesting that in his concern for rhythmic exactitude, he sometimes missed the poetry and mystery of the music, as well as its meaning. He also tended to overdo the climaxes. As the composer’s elder grandson Wieland Wagner, quoted by EMI producer Walter Legge, put it: “Walter, if you don’t soon find me a good Tannhäuser conductor, I shall be reduced to Solti and his orgasms in every second bar.” (Schwarzkopf: On and Off the Record. New York: Scribner’s, 1982). That said, returning to the recording for this review, I now find that Solti’s supercharged approach pays enormous dividends in a work as long as the Ring. Wagner’s great epic has more than a few pages of tedium, and Solti’s unfailing energy is enormously helpful in enlivening such passages. By contrast, listen to the Ring as recorded by Herbert von Karajan and the Berlin Philharmonic for Deutsche Grammophon about 10 years after the Decca Ring. Musically, it is impressive, but there is no sense of the sheer theatricality of the piece. The DG Ring‘s recorded sound was also disappointing. Culshaw and his team got a dark, three-dimensional sound quality in their recordings that makes the DG version sound flat by comparison. Wagner’s orchestra for the Ring features a much larger-than-normal brass section with some lower brass instruments actually conceived by Wagner (e.g. bass trumpet, Wagner tubas, contrabass trombone). Then, of course, there are the instruments used by the Vienna Philharmonic horn players. They have a more mellow sound and smoother legato than any other French horns. In the Decca recording, the weight and color of all these brass instruments is beautifully captured throughout the Ring — as, for example, in the prelude to Das Rheingold and in the accompaniment to Hagen’s “Hier sitz’ ich zur Wacht, wahre den Hof” in Act I of Götterdämmerung. As for special effects, it is still difficult to improve on the sound of the 18 anvils as Wotan descends to Nibelheim in Das Rheingold. Casting for the Ring was as difficult for Decca in 1958 as it is today. The producers had hoped to have renowned Wagnerian Kirsten Flagstad as Brünnhilde, but because she was in her mid-60s and in failing health, it was soon evident that she was no longer up to the role, even on a recording. They did, however, still benefit from the power of her name by casting her as Fricka in Das Rheingold. In casting soprano Birgit Nilsson, at the time an emerging opera star with a powerful, electrifying voice, as Brünnhilde, the producers scored a huge success. Although, to my ears, Nilsson lacks tenderness and beauty of phrasing in the quieter passages, and sings sharp from time to time, she is stunning in the duet and in the Immolation Scene in Götterdämmerung. Other singers who stand out are George London as Wotan and Eberhard Wächter as a really commanding Donner in Das Rheingold. Régine Crespin is a wonderful Sieglinde in Die Walküre, but Wolfgang Windgassen as Siegmund doesn’t begin to compare with Jon Vickers on the Karajan recording. Special mention must be made of Hans Hotter as Wotan in Die Walküre and Siegfried; already in his 50s when these recordings were made, his sound was still uniquely expressive and his command of the text second to none. As a historical curiosity, one might note that in the Decca Die Walküre, Helga Dernesch takes the small part of the valkyrie Ortlinde. In the DG Ring a decade later, she graduated to the role of Brünnhilde in an unfortunate example of miscasting on Karajan’s part. There is also miscasting in the Decca Ring: Dietrich Fischer-Dieskau was one of the greatest of all lieder singers, but his voice was far too light for Gunther in Götterdämmerung. The best way to listen to Cooke’s long and often complex analysis is to have the text and the musical examples in front of you on your computer. You can do this because Decca has thoughtfully included in this boxed set a CD-ROM containing the material, as well as the complete libretto of the Ring. 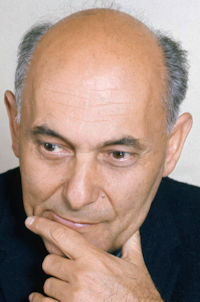 2012 was the centenary of Georg Solti’s birth. Universal, now the “parent” company for which Solti recorded exclusively for half a century (Decca), released several most welcome tributes. These include a (numbered) “Deluxe” limited edition of what has been called the greatest recording of all time, Wagner’s Ring Cycle. On this, between 1958 and 1965, Solti worked with legendary producer, John Culshaw, and an amazingly satisfying, accomplished and stimulating cast of soloists and the Vienna Philharmonic Orchestra and Vienna State Opera Chorus. The result, too, was “legendary”. a 40-page brochure of original Decca advertisements and reviews. The first aspect of this release that cannot but strike you is indeed its very sumptuousness, its luxury. The entire package weighs nearly 12 lbs. It comes in a large black and gold stiff (cardboard) box with an equally extravagantly-embossed white slip case. These are all 12″ square and 3″ deep… as were the original LPs. The box has four components, which each slides easily out of the substantially-constructed slip case. Over and above the abundance of resources which Decca offers us in this edition has to be the quality of the original Culshaw Ring. It does – as was to be hoped – stand up particularly well to the transfer from tapes made half a century ago. So well, in fact, that you begin to wonder whether the engineers in the 1960s knew something that we didn’t about how to “future proof” their recordings. In fact, Philip Siney, the engineer used digital tapes from 1997 to remaster the set, so badly had the analog ones from 1958, 1965, 1962 and 1964 (in cycle order) deteriorated. What Solti and Culshaw achieved was truly remarkable (and risky): theirs was the first complete Ring to be recorded. To have succeeded so spectacularly with interpretation and performance quality, to have created what is still the (or at least a key) reference set at the first attempt was a huge achievement. Hence the added appeal of the books, prints, facsimiles and other material which Decca has included in this set. For anyone interested in the history of recorded sound, in the recording and performing traditions built by the two generations of singers in the years after World War II, as well as for lovers of opera in general and Wagner in particular, this is a wholly attractive release and Decca is to be congratulated for making it. The sound is projected cleanly, uniformly and to the consistent and enduring advantage of these superb performances. The strings are full and characterful; they convey emotion, excitement, pathos and the monumental drama of the cycle. They never upstage the woodwind, though, which is light, transparent and tuneful at all times. The brass is clear and incisive enough to have you start from your seat more than once. Culshaw and Solti were aiming for a theatrical Ring, not a visionary or mystical one. Still less one contorted to portray, say, the agonies of Edwardian scarf-weavers in New York. It’s pure drama – as both Humphrey Burton’s BBC documentary, “The Golden Ring” and Culshaw’s “Ring Resounding” demonstrate. Two of the most striking musical features of Solti’s “Ring” are the quality of its soloists; and the range of orchestral impact. Birgit Nilsson’s Brünnhilde is stunning; her voice is also majestic and golden – but neither haughty nor cruel, two traps avoided. Hers is perhaps the finest such interpretation ever. The two Wotans (George London in Rheingold, then Hans Hotter in Walküre) are both commanding, lofty, authoritative. Just as they should be. But these very characteristics in the personae of each also suggest justified humanity; or at least approachability. Flagstad came out of retirement for her Rheingold Fricka. Her performance has all the queenliness and detachment on which the character is predicated. Ludwig’s Fricke in Walküre and Waltraute in Götterdämmerung are superb. They typify the heights, the authority, the confidence that Solti’s Ring stands for. Gustav Neidlinger personifies malice and ruthlessness in Alberich in ways that most successors have consciously emulated; had to emulate. Stolze’s Mime seems to originate in the dark, chilling tangles of nordic forests and slide in and out of the intricacies and complexes of Wagner’s music with an almost Freudian warp. Similarly, Gottlob Frick’s Hunding in Walküre frightens; his Hagen in Götterdämmerung repulses. The reservations one had of the Siegmund of James King from the original release still seem sustainable: slight superficiality and lightness. By the same token, nuanced though he is, Wolfgang Windgassen (Siegfried) also lacks a little presence in places; yet it’s entirely possible to exchange variety and sensitivity for “uneven” – he adjusts his performance according to circumstances and has some startlingly moving scenes… notably his final one, in Götterdämmerung. Regine Crespin’s Sieglinde is more classic… dramatically convincing, beautiful of tone and is stunning in the way she articulates the melodic messages that Wagner gives her. Similarly, Fischer-Dieskau’s Gunther and Joan Sutherland’s Wood Bird (in Götterdämmerung and Walküre respectively) are true gems. The playing of the Vienna Philharmonic Orchestra and Vienna State Opera Chorus is, of course, exceptional. They’re in command and yet totally expressive from first to last – and that’s a long span. Not only do individual players shine, stun, project and impress; but the section and tutti work is both magisterial, immediate, and sonically approachable at the same time. Here too, there is an inevitable “edge” in some places on recordings as old as these. But the sense of presence and approachability which might otherwise come from a live recording is gratifying and compelling. Although conceived on the grandest of scales (by Wagner), there are moments of great intimacy in the Ring. The epic ending (of Götterdämmerung), Wotan’s Farewell at the end of Die Walküre, Siegfried and Brünnhilde’s love duet at the end of Siegfried and many other climacterics throughout all four operas all need as much orchestral power as can be summoned. And they must be sustained in ways that other nineteenth century doesn’t demand. At the same time, such passages as Siegfried and the wood bird (in Siegfried), many of the dialogs, monologs and even some of the scenes between Gods and between Gods and mortals as towards the end of Rheingold, require a delicacy and sweetness in projection. Solti and his forces have these in abundance, and in ways that truly surprise: the drama becomes very real – present rather than iconic. But it does not lose its majesty. This is a key gift of Solti’s. Against (actually, in concert with) this aspect of highlighting dramatic contrasts, the acoustic in which we experience the voices allows their measured, expert, characterful, unhistrionic yet totally involved roles to impress us to the full. Indeed, the remastering is precise enough for those aware of the original LP or even cassette issue to remember and compare. There is even greater clarity, even finer projection, even more convincing personification of Wagner’s archetypes. This is exactly what owners of the earlier media would have hoped for. And a living, convincing, whole, holistic and vibrant experience is just what this edition delivers from the unforgettable E♭ pedal at the start of Rheingold to the uplift of the Redemption theme and the final scream at the end of Götterdämmerung. The soundstage is not so deep and vivid as we might expect now. Stretches of recorded silence – particularly at the end of scenes and acts somehow assure us that we are listening to a “performance”, not a “production”. And the stereo image is excellent: defined, definite and unambiguously dramatic. But the image is – without ever being claustrophobic – not so spacious as we would probably expect in twenty-first century digital versions of the operas. That doesn’t, in fact, reflect on Culshaw’s statement about the world of the cycle… “Ring in an attic” vs “Ring in Space”. It suggests, rather, that the music is profound and meaningful enough to speak for itself. And the clarity and incision of the recording only aids that laudable aim. Rarely does any of the transcriptions here show its age sonically; there is, for example, slight distortion on CD 3 of Die Walküre about five minutes into track 2. But these are rare moments and ones which are quickly subsumed into our wholly positive experience of the Ring. To offset this are such exhilarating moments as the anvils newly-forged in compelling rhythm about a third of the way into Rheingold; and Donner’s “Heda, Heda, Hedo” as he strikes the single hammer. If you don’t already own a Ring cycle, and want all the trimmings, this set – expensive though it is (though no more than today’s equivalent of the $60 or so the original set cost at the time) – has everything to recommend it. The authority and accomplishment of the interpretation have yet to be bettered. The performances (particularly those of the principals mentioned above) and playing are exemplary… and are a superb testament to a performing style and world that have all but gone now. You may be put off by opting for a sound that you might fear would be boxier, closer, more restricted, less buoyant, more artificial, or simply scratchier than you’d choose nowadays. In fact the acoustic on this set has none of those limitations; it faithfully reflects the spaciousness and appropriate aura that would have been experienced had you been sitting in on those amazing recordings in Vienna’s Sofien Hall over 50 years ago. The ways in which this recording is not a simulacrum of the Bayreuth stage, and the measures taken by everyone involved to produce an enduring recorded Ring, are explained in the books that you get with this Decca release. They – otherwise (previously) hard to get hold of – only add to the value of the set. To have the Blu-ray disk if you’re already happy with the CDs may for many not be such an advantage as the libretti. And the prints of photos from the recording sessions are really chiefly of souvenir value; though – like the facsimile of one of Solti’s scores, annotated, and the brochure of original Decca advertisements and reviews – are significant pieces of recording history. After all, this set is in Solti’s honor as much as Wagner’s, although it is a fitting tribute to Birgit Nilsson, especially, as well. In conclusion, this is a superb release: it has everything that the original (many would say the best) complete Ring recording had – and much more. The music-making throughout those sessions (which you can come to know through the book and DVD etc in a way that is possible in such details with few other recording projects) is as monumental as Wagner’s conception. 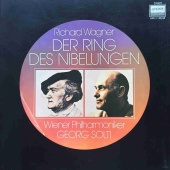 Wagner lovers – particularly those who don’t have the Solti Ring – and/or can afford this indulgence in making a comparison with such other outstanding cycles as Böhm’s 1967 set (also on Decca 446057-2 is a good choice), should do so. Recommended without hesitation. Many music critics, listeners, and audiophiles (myself included) consider the Georg Solti Ring to be the greatest recording of all time. It is difficult to dispute that conclusion. First of all, the size and scope of the project at the time it was recorded (1958–1965) was unprecedented. The most important reasons for the success of this Ring as a performance are Solti and the Vienna Philharmonic Orchestra. In 1958, Solti was a young and rising conductor with potential, but no one had a clue about his Wagnerian credentials, except perhaps producer John Culshaw. Solti was an enormous gamble that paid off more than anyone could have imagined. Despite being known throughout his career for his hyperdynamic, hard-driving approach, Solti does neither here. His sensitivity to Wagner’s micro and macro architecture is quite remarkable. There is little doubt that this is the most dynamic and powerful Ring ever recorded, but it is not overstated or over- driven. There is an appropriate emphasis on the orchestra that is central to Wagner’s concept. He captures the grandeur of the music, but he maintains a transparent sonority with the help of the sound. Solti is aided immensely by the Vienna Philharmonic Orchestra, but in the final analysis, he is the conductor, and the orchestra has never sounded quite like this in any other recording. This is especially true of the brass section that is so critical to the Ring sonority. That includes the dark, burnished, peerless French horns, as well as the silky sweet strings and juicy harps. All of this is presented flawlessly by the amazing sound. Culshaw and engineer Gordon Parry placed the soloists on an elevated stage behind the orchestra, exactly as you would hear them in an opera house. Add to this the almost palpable sense of space that is perhaps unique to these recordings, and you have the principal reason why the Solti Ring became a best seller. The cast included the best Wagnerian singers available, but some of them, most notably Hans Hotter, were past their prime. Hotter is clearly laboring in “Wotan’s Farewell” from Die Walküre. Wolfgang Windgassen is also sometimes stretched to his limits, but remains entirely musical and credible as Siegfried, probably because no one knew the role like he did. Earlier Bayreuth performances of the Ring with Hotter and Windgassen in their primes were subsequently released, but they don’t have Birgit Nilsson, and their sound is not remotely comparable to the Decca Ring. Previous CD releases of the Solti Ring have been marred by a steely hardness of the voices and orchestra primarily in the high frequencies. Blu-ray audio largely resolves that problem and preserves the unique spatial signature and balances be- tween soloists and orchestra heard on the original British Decca pressings, but with more fine instrumental detail. The elaborate initial Blu-ray audio release also included 17 standard CDs, a DVD, and numerous variably useful extras. This lat- est version contains the Ring on one Blu-ray audio disc, the complete librettos, plus interesting essays by Culshaw on the re- cording process, all at less than half the cost of the initial complete Blu-ray release. It therefore seems like the ideal pack- age for audiophiles interested in the best sounding Solti Ring without the extras. In a happy confluence of anniversaries, Hungarian conductor Georg Solti’s birth centenary (October 21, 1912) and German composer Richard Wagner’s birth bicentenary (May 22, 1813) arrive only one year apart. 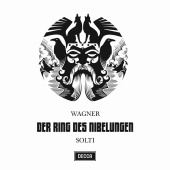 In celebration of their achievements, Decca has released, in the best digital sound possible, 7,000 numbered copies of a deluxe set of Solti’s celebrated stereo recording of Wagner’s four-opera cycle Der Ring des Nibelungen. Listening to this monumental achievement, recorded between 1958 and 1964 with the Vienna Philharmonic and many of the finest Wagnerian singers of the era, enables us to appreciate anew the scope of both men’s greatness. The new set’s sound, drawn from digital masters created in 1997, is definitive. As unimaginable as it may seem, the original analog tape masters of what has been called the most important stereo recording of the 20th century have disintegrated to the point where another digital remastering is all but impossible. Thankfully, the digital mastering of 1997 was accomplished in 24-bit, 48kHz high-resolution sound, which was pretty much digital state-of-the-art for the period. Although it was impossible for music lovers to hear the full glory of that digital remastering back then — CD has always been limited to 16-bits, 44.1kHz, which cannot convey the full sonic spectrum of music and voices — it is now possible to deliver the full glory of 24-bit, 48kHz sound via the high-resolution capacity of Blu-ray. Hence, the new set includes, for starters, Solti’s entire Ring on a single high-resolution Blu-ray disc. To listen on a good system is a revelation. Decca’s new multi-LP sized Ring package, housed in a cardboard slipcase, consists of four hardbound books that together weigh over 11 lbs. Vol. 1 contains recording producer John Culshaw’s long-out-of-print Ring Resounding, an engrossing, book-length memoir of the recording from genesis to completion. Vol. 2 contains a single Blu-ray disc of the entire cycle in high-res sound; 14 CDs of the same music, sounding better than the 1997 digitally remastered set, because of improvements in CD technology; and a 15th CD of Solti’s contemporaneous recordings of three Wagner overtures and two Ring-associated chamber works. Vol. 3 contains large-format prints of session photos; original promo materials and reviews; facsimiles of one of the maestro’s marked-up scores, complete with notes and a discussion of him in the studio by Charles Kaye, Solti’s executive assistant 1977–1997; the complete text of Deryck Cooke’s learned introduction to the Ring cycle; and a DVD of The Golden Ring, Humphrey Burton’s hard-to-stop-watching 1966 documentary on the recording of Acts 2 and 3 of Die Götterdämmerung, complemented by notes on the filming. Finally, Vol. 4 contains all the librettos, with Wagner’s German mirrored by Stewart Spencer’s English translation. Amazon’s price of a set that’s sure to sell out is heavily discounted. While Georg Solti recorded music over a span of half a century — from 1947, the year after he was appointed music director of the Bavarian State Opera in Munich, to 1997, when he served as music director laureate of the Royal Opera House, Covent Garden, and had founded the World Orchestra for Peace — it is to his Ring that we ultimately turn for confirmation of his greatness. With the release of the high-resolution Blu-ray version, that assessment can be accomplished in greater depth than ever before. The Decca team achieved a quality of sound and detail unprecedented for opera recordings of the period. As is revealed in The Golden Ring documentary, Solti, Culshaw, and a crack engineering team (which included Gordon Parry and Christopher Raeburn) were committed to making the most of their historic opportunity. With the support of Decca, which decided to suppress the actual first stereo Ring, recorded live at Bayreuth in the mid-1950s (conducted by Joseph Keilberth and now available on the Testament label), and instead release Solti’s studio effort, the men went whole hog. In the era before home video, DVD, and Blu-ray, Solti was challenged to make an opera recording that came across as vividly as a staged performance. The Ring offered him a supreme opportunity to provide a model of what can be done with audio alone. Thunder, anvils, and a host of other sound effects were only part of Culshaw and crew’s attempt to achieve a “you-are-there” experience so vivid that listeners would not feel shortchanged by the absence of visuals. Taking advantage of the “new” stereo medium, a three-dimensional sound stage of sorts was simulated by literally shepherding/shoving the singers around (both from left to right and from front to back) during recording. While dynamics were somewhat compressed — you can see Parry riding the master volume and mixing levels during peak passages, doubtless concerned that Birgit Nilsson’s trumpeted high Cs and an anvil at full tilt would either wreck loudspeakers or cause needles to jump from groove to groove — the team achieved a quality of sound and detail unprecedented for opera recordings of the period. On the new Blu-ray, for the first time in the digital era, we can get startlingly close to the sound the engineers heard at the control room mixing board. Cellos and basses have far more richness than on CD, the authentic timbre of the Vienna Philharmonic’s rotary-valve trumpets comes through with startling immediacy, and the orchestra’s fabled silken strings sing as never before. Voices, too, take on greater richness, weight, and depth. The sound and sweep of orchestra and voices at full throttle is so rich that, at times, it takes the breath away. As for those sound effects, the anvil strikes on Blu-ray were startling enough to wake one of my pooches from sleep. Indeed, so captivating is the sound that it took me days before I could tear myself away long enough to write this appreciation. Many of the critics who have decried Solti’s virtually Technicolor sound were probably unable to hear the recording as its engineering team wished it to be heard. When played back in high-resolution, virtually everything Solti does makes musical sense. Keenly aware of his singers’ capacities, he plays to their strengths. While giving them sufficient space to negotiate passages they find challenging, he knows when they can let it rip. When Nilsson gets going full force, for example, he allows the orchestra to rise to equal heights. For listeners who have always found Wagner’s music “heavy” or forbidding, Solti’s Ring in high-resolution sound is a perfect way in. Wagner was so convinced of the power and importance of his story and music that he allowed himself to write music dramas of unprecedented length, with three of the operas clocking in at over four hours and, in the case of Das Rheingold, the first of the four Ring operas, a single 2½-hour act. Without visuals, or with the static visuals that weighed down many old-time Ring productions, long periods of dialogue can prove tedious affairs. Solti seemed aware of this problem. By choosing great singers adept at animating dialogue, and by skillfully underscoring the orchestral motives that hold the Ring together musically, he managed to make an audio recording every bit as vital as was Francesca Zambello’s 2011 “Green” Ring for San Francisco Opera. 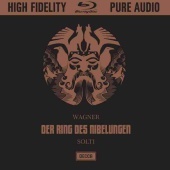 For listeners who have always found Wagner’s music “heavy” or forbidding, Solti’s Ring in high-res sound is a perfect way in. Especially when listening is augmented by Cooke’s fascinating introduction, the glories of Wagner’s orchestral scoring, not to mention the immense power of his vision, are revealed. There have been other Wagnerian conductors of equal or even greater vision — Wilhelm Furtwängler being one — but Solti was the first with the ability to marry musical vision with superior recording technology. At virtually the same time as the release of the deluxe Ring, Decca has issued no fewer than five Solti CD box sets: Mozart operas (15 CDs), Strauss operas (15 CDs), Verdi operas (16 CDs), Wagner operas (36 CDs), and Solti: The Legacy 1937–1997 (2 CDs). The latter begins with Solti playing the glockenspiel in Toscanini’s 1937 Salzburg performance of Die Zauberflöte; extends through Solti and Murray Perahia playing piano in a 1987 Chicago Symphony Orchestra performance of Mozart’s Concerto for Two Pianos and Orchestra, recorded during Solti’s 22-year tenure as CSO’s music director; and ends with a 1997 recording of “Pace, pace mio Dio” from Verdi’s La forza del destino, with Angela Gheorghiu, whom the conductor championed. The bulk of the tribute, however, is devoted to a host of previously unissued opera excerpts, recorded live. Hearing them reminds us that as much as Solti is known for the drive of his Ring, he is also able to slow down and let us smell the flowers that perfume a good deal of Die Walküre’s first act and, in Siegfried, the young hero’s meditations and Brünnhilde’s glorious awakening scene. Any opera lover who thinks she can live without hearing Pilar Lorengar, Josephine Veasey, and Keith Engen’s “Soave sia il venti” from Mozart’s Così fan tutte at the Royal Opera House, Covent Garden, in 1968, recorded live during Solti’s 10-year tenure as ROH music director; Elisabeth Schwarzkopf sing with remarkable poise and grace in an astoundingly slow final trio and duet from Strauss’ Der Rosenkavalier, recorded in 1959; and Hildegard Behrens’ brief excerpt from the Immolation Scene of Götterdämmerung, recorded at Bayreuth in 1983 with tone far more beautiful than anything Birgit Nilsson ever produced, had better think again. An equally rare experience is Hans Hotter’s performance of Schubert’s “An die Musik,” recorded in 1992 at Solti’s 80th-birthday celebration in Buckingham Palace, when the great Wotan of Solti’s Ring was 81. As we listen to these and a host of other frustratingly brief opera excerpts, we are reminded that as much as Solti could beat his orchestra into a Wagnerian frenzy, he could just as easily turn on a dime and stretch tempos out to near-infinity when his singers could employ them to their advantage. This versatility ensures that his Ring, especially when heard in the new Blu-ray issue, will remain a recording for the ages. ‘Very nice,’ sneered a rival producer, hearing that Decca were embarking on the Ring. ‘But of course you’ll never sell any.’ To him it was just an obscure, prestige project. But at a stroke – Donner’s awesome hammerstroke in Rheingold, to be precise, the loudest sound then recorded – Decca’s new venture was to galvanise classical recording, and begin a new era. In the 1950s records evolved from brief, clumsy 78s to LPs, with wide-frequency recording, half-hour sides – and stereo sound. Decca’s Vienna-based recording team, headed by John Culshaw, began to exploit these innovations to demonstrate that LP could carry major works, not just adequately but triumphantly. Rheingold (1956) proved that recordings needn’t be fragmentary substitutes for stage performance, but could generate their own legitimate dramatic life – and popular appeal. Rheingold not only sold, it soared into the pop charts. Rheingold’s stereo techniques, developed throughout Siegfried (1962), Götterdämmerung (1964) and Walküre (1965), defined a soundstage around which the singers moved as if in a real production. To maintain this sense of live performance, conductor Georg Solti insisted they sing longer takes, often without scores. Decca’s earlier attempts to record the Ring at Bayreuth, notably Joseph Keilberth’s cycle, sounded relatively stage-bound – fine for aficionados but unlikely to make new converts. To raise the imaginative temperature, Culshaw’s team introduced acoustics and sound-effects – not randomly, like many imitators, but sounds that might feature in live performance, idealised to create the ‘invisible stage’ of Wagner’s soaring imagination. These would have been pointless, though, without a correspondingly awesome performance. This, with the magnificent playing of the Vienna Philharmonic, Solti certainly provided. Arguments still rage about his interpretation, compared especially with the more flowing, homogeneous Wilhelm Furtwängler manner; but there’s no doubt about Solti’s dynamism and towering sense of scale. He illuminates Wagner’s imagery, especially the Ring’s crucial natural forces, with vivid power, yet there’s no want of warmth and tenderness, or clarity in the elaborate textures of motifs. No less outstanding, of course, is his cast, still unrivalled – an amazing Wagner ensemble spanning three eras, from Kirsten Flagstad and Set Svanholm to Hans Hotter, Birgit Nilsson and a host of younger voices like Eberhard Waechter, James King, Helga Dernesch and Gywneth Jones. Nilsson’s Brünnhilde is steely and untiring yet full of passionate femininity. Her father Wotan, sturdily sung by George London in Rheingold, matures in Siegfried and Walküre into Hans Hotter’s tormented, world-weary divinity – probably the finest and most nuanced on any recording, though by Walküre his voice had aged considerably. Wolfgang Windgassen’s Siegfried is captured late, but still youthful. Gustav Neidlinger’s Alberich and Gottlob Frick’s soot-voiced Hagen remain benchmarks, unmatched for Satanic nobility, as do Christa Ludwig’s Fricka and Waltraute. Most controversial casting is probably Gerhard Stolze’s rasping Mime (struck by polio during Siegfried) but the force of his performance is undeniable. Dietrich Fischer-Dieskau’s unusually heroic Gunther and Joan Sutherland’s striking if badly articulated Woodbird add extra star quality. Documented in books and television, Decca’s Ring raised the status of recording generally. Other versions have their virtues, but there’s little doubt that Solti and Culshaw opened the gates for the 40-plus recorded Rings we now enjoy. Most authorities agree that it’s still a great place to start. The sound has survived half a century well, though the present CD transfer isn’t ideal; a much-praised SACD edition appeared only in Japan. Individually, the operas are scarcely less impressive, although Walküre, beset by problems and disputes, is the least good. But even Solti’s detractors have to admit the awesome stature of Götterdämmerung, in which performance and recording unite with seamless strength to evoke the power of cosmic, cathartic tragedy. It hasn’t been surpassed; it may never be. In 1968 Decca issued all four music-dramas in a green and gold wooden box set of 19 LP records. This gave us three further LPs as a bonus: Deryck Cooke’s spoken Introduction in English featuring 193 excerpts from the recordings. For me this was the door to Wagner: I cannot imagine – nor can I recommend – a better way to grasp the leitmotif structure of the music. This is not included in the Esoteric presentation which is a Japanese product. Physically, the Esoteric set is substantial: 6kg comparing with the High Street Decca box set at around 1kg. The new set contains three books: two are the most substantial librettos I have ever seen, in German and Japanese. The third is a Japanese copy of John Culshaw’s book; extremely useful. And then there are two booklets: The Notes and Track List – also in German and Japanese however, you can save the European Decca CD set booklet before you discard the CDs. The Japanese contents continue with a DVD being the BBC documentary film. Finally, seven DVD format volumes protect the four musical works on fourteen CD/SACD hybrid discs. All are housed in a luxury box, protected by semi-permanent transparent sheath, and wrapped in a cardboard outer carton for shipping. The Ring’s theme is not just the old Norse-Germanic world of the pre-Christian mindset – do not call it Pagan – but the perennial human predicament of the triumph of gold over love. It is a very tall order to recreate for the modern listener this timeless world beyond any territory. Frankly, I do not think that modern productions, far less home videos, can do it. As a comparison, I chose James Levine’s Ring on DG because it is a good stereo recording of a “driven” and dramatic reading. Separated from Decca’s production by thirty years it is an excellent modern digital recording; it suffers none of the harsh treble or compression of early CDs. An expert remastering of this excellent sound would be a very welcome thing. There is much that is great. Sonically, I rediscovered Lawson’s Law. Recordings sound best replayed on domestic loudspeakers closest to the studio monitors on which they were voiced. DG credit B&W loudspeakers; Decca acknowledge the use of Tannoy Canterbury speakers. And thus it emerged at my home. On an Esoteric player, amplifier and Tannoy loudspeakers (a matched system) not a trace of the “chestiness” one might look for. The natural sound was breathtaking, making it impossible to break the listening session. The DG recording sounded compressed and slightly artificial until played on a British sound hi-fi (ProAc loudspeakers). The advantages of synergy (or consistency) were reversed. This is disturbing. Esoteric, longtime collaborators with Tannoy, are now publishers of CDs, and so they complete a chain of transmission – from programme source to monitor loudspeaker. 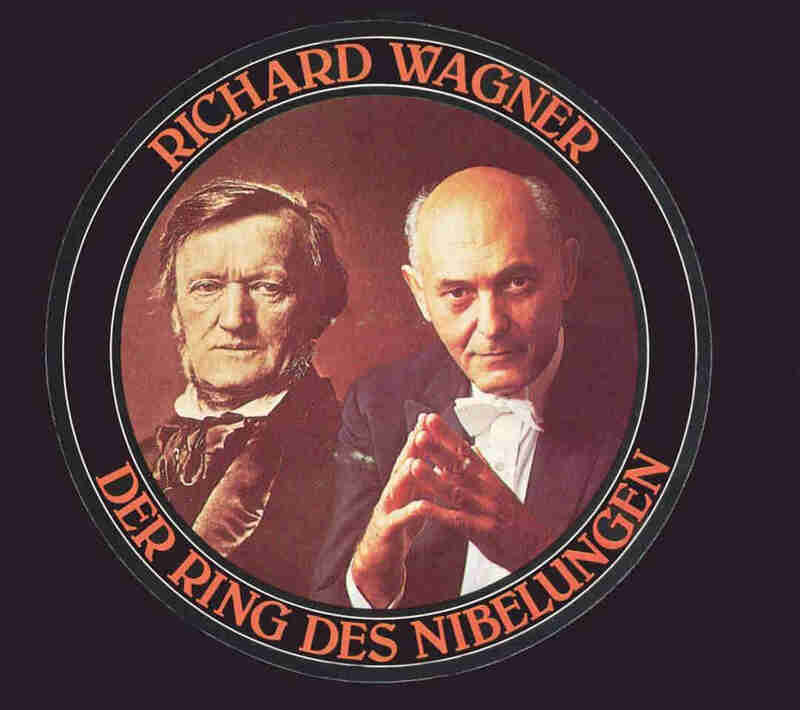 It comes as something of a shock to realise that this pioneer recording of Wagner’s Ring is some fifty years old. Decca have now issued it again in a luxury package. It includes the complete recording and some supplementary CDs. To these it adds a reprint of producer John Culshaw’s account in Ring Resounding of the process by which the massive tetralogy was committed to disc. You will also get a complete text of Deryck Cooke’s analysis of the music, complete libretti, translations and other essays. The supplementary material constitutes three substantial volumes and the result, packaged together with a fourth volume containing the recording itself, is issued to commemorate the 200th anniversary of Wagner’s birth and the 100th anniversary of the birth of the conductor. It also anticipates the spate of reissues from other companies which may be expected as the recordings themselves come out of copyright. It might be thought that many readers of this review may be familiar with these performances, but there will be many to whom the recordings will nevertheless be entirely new; and the opportunity can also be taken to make some comparisons of this pioneering studio recording with its successors. 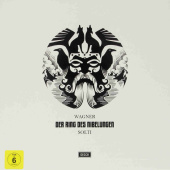 When this was first issued, there were no other recordings of Wagner’s Ring in the catalogue; now there are dozens. That said, there are surprisingly few purpose-made recordings even today. This is not surprising, given the expense and complexity of setting up a studio project. There are those who find that the issue of ‘live’ recordings from broadcasts or the opera house have an immediacy that studio session cannot match. The Ring is particularly prone to stage noises – especially in some modern productions – and suffers even more from the minor and major imperfections that can arise in the course of a live performance. For that reason, I am ignoring all the recordings which derive from live performances even when these have been ‘patched’ with passages taken from rehearsals. I will concentrate purely on those recordings which come from the studio and should therefore be expected to be note-perfect throughout. I am aware that this will exclude from consideration some major sets, including both of those by Wilhelm Furtwängler, the superb set in English conducted by Reginald Goodall, Karl Böhm’s and Daniel Barenboim’s Bayreuth cycles, as well as many others that have found critical approval over the years. One has to draw the line somewhere. Shortly after the Solti Ring was completed, Herbert von Karajan began a DG cycle with the Berlin Philharmonic as an adjunct to his stage performances at the Salzburg Festival. There were no further studio recordings until the digital era, when the East German company Eurodisc committed to CD a set conducted by Marek Janowski. This was followed by an EMI set conducted by Bernard Haitink, recorded at the same time as his Covent Garden performances but with the Bavarian Radio orchestra (reviewed for MusicWeb by Göran Forsling (review)); and another from DG conducted by James Levine based around his performances at the Metropolitan Opera. There have been no others since, and given the expense involved in such a massive undertaking we should not perhaps expect any. The present Das Rheingold is dominated by the superlative performance of Gustav Neidlinger as Alberich. John Culshaw does not mention the fact in Ring Resounding, but in his incomplete and posthumously published autobiography Putting the record straight it is amazing to learn that he was put under considerable pressure to use Otakar Kraus (the resident Alberich at Covent Garden) instead of Neidlinger. Kraus, as can be heard from live recordings, was good in the role but Neidlinger is simply great. He has a nobility of tone that makes the Nibelung into a tragic figure as well as a villain, and his delivery of the curse is blood-curdling. When he steals the gold, Wagner specifies in the score that “Alberich’s mocking laughter is heard.” Usually, if we get a laugh at all, it is a generalised snarl or shout of derision; but Neidlinger has noticed that when Alberich’s mocking laughter is heard again as Mime is killed in Siegfried, the laughter is a notated version of the Nibelungs’ hammering motif; and that is what he gives us here. It works superbly, even if this is the only point in the set when notes that Wagner did not actually write are added to the score. Comparisons with his rivals in the other studio recordings – Zoltán Kélémen for Karajan vicious rather than heroic, Theo Adam for Haitink unsteady in sustained passages, Ekkehard Wlaschiha for Levine rather lachrymose in his lamenting passages, and Siegmund Nimsgern for Janowski almost too heroic, serve only to underline Neidlinger’s superiority which remains unchallenged after some fifty years. In the opening scene he is teamed with the three Rheintochter. One of these, Ira Malaniuk, was a famous Fricka and seems to have been engaged not so much on her own account but as a cover in case Kirsten Flagstad fell ill or was unwilling to take the latter role. She has a commanding presence as Flosshilde which underlines her underlying sense of seriousness as opposed to her more light-hearted sisters. These are taken by Oda Balsborg and Hetty Plumacher, two regulars at the Vienna State Opera at the time but neither of whom advanced much beyond supporting roles. When Decca came to record Götterdämmerung five years later, these roles were taken over by Lucia Popp and Gwyneth Jones, both of whom became world renowned for much more than supporting roles. In 1958 Decca were presumably not prepared to fund such extravagances in casting. Balsborg and Plumacher are fine; although in Ring Resounding Culshaw complains that there were passages when one or the other of the Rhinemaidens were out of tune, no such problems are apparent in the recording as completed. This brings us to the vexed question of consistency of casting throughout the four Ring operas. Even in cycles given in the opera house over a period of a week or two, it is not uncommon to find different singers undertaking some parts from one evening to another – either because of the non-availability of some individual singers, or to spare them strain. Sometimes this can be positively desirable. It would be odd indeed to find the mezzo-soprano who sings the major role of Waltraute in Götterdämmerung undertaking the same part in the final Act of Die Walküre, where she is merely one of a collection of eight Valkyries who act as a sort of semi-chorus. If she did, it would be difficult for the singer to avoid overpowering her companions – even though in Die Walküre she is drawn in a more sympathetic light, in a manner than anticipates her later resolve to be the only Valkyrie to visit the exiled Brünnhilde. In this Ring, recorded over a period of seven years, there are more changes of cast from one opera to another than might be considered desirable. The replacement of Kirsten Flagstad in 1958 by Christa Ludwig in 1965 was necessitated by Flagstad’s death; but of the eight solo singers in Rheingold who appear in later episodes of the cycle, no fewer than six are re-cast in the sets recorded later – the only two who remain unchanged are Neidlinger and Böhme. On the other hand, Karajan’s cycle has even more changes of cast, with two Brünnhildes and two Siegfrieds as well as two Wotans and two Mimes. One member of the Rheingold cast who is replaced in later episodes is George London as Wotan, where Hans Hotter takes on the mantle of the role in Walküre and Siegfried. Hotter was one of the great Wotans in the period following the Second World War, but by the 1960s his voice was showing distinct signs of wear. His vibrato could be unsteady, and the bass orientation of his tessitura could make upper notes sound ‘woofy’ although he never shows signs of strain even in the highest register. There are times in this set where the unsteadiness is more obvious than others – the scene with Mime is probably the worst offender in this respect, where Culshaw notes that he seemed to be running short of voice – but his intelligent reaction to the text and his gentle inflection of the lyrical passages remains a model. Culshaw says that the part of Wotan in Rheingold “never really suited” him and that this was why George London was chosen for that opera – but one suspects that the real reason was simply that Hotter was unavailable at that time, being under contract elsewhere. London could never be accused of being gentle in his inflections – even when he is talking in his sleep in his opening phrases, he sounds wide awake – but he was not an unintelligent singer and his response to the text is vivid. He is magnificent when commanding Donner not to kill the giants, and sounds suitably overawed by Erda’s warning. In other Wagnerian roles, such as the Dutchman or Amfortas, he could be unpleasantly lachrymose when required to sound emotional – as he is indeed as Wotan in Erich Leinsdorf’s 1961 studio Walküre – but there is no call for this in Rheingold and he certainly sounds more authentically Wagnerian than Dietrich Fischer-Dieskau (for Karajan in Rheingold) and less grittily unsteady than Theo Adam (for Janowski). James Morris (for both Levine and Haitink) is the equal of London in Rheingold but loses points to Hotter for subtlety in the later operas, as does Thomas Stewart who takes over there from Fischer-Dieskau for Karajan. Kirsten Flagstad was the great Wagnerian soprano of the period 1935-50, and assuming the mezzo-soprano role of Fricka in Rheingold she remains every inch a commanding presence. Christa Ludwig – who took over the part for Solti after Flagstad’s death- is mellower, but has a sense of presence which sustains a high level of drama. By comparison Josephine Veasey (for Karajan) is plainer and less involved; Ludwig (again, twenty years later) for Levine is older and more worn of tone; Yvonne Minton for Janowski is good and solid but slightly placid; and Marjana Lipovšek for Haitink does not have Flagstad’s or Ludwig’s nobility. In the roles of the minor gods and goddesses, Viennese stalwarts Waldemar Kmentt, Eberhard Waechter and Claire Watson have good presence and don’t let the side down. Jean Madeira, also a fine singer, is properly stentorian as Erda; she also is replaced in Siegfried by Martha Höffgen, who sounds remarkably similar in tone if slightly less secure at the top of her range – in what is some ridiculously high writing up to A-flat for a deep contralto. Walter Kreppel, another member of the Vienna State Opera at the period, is firmly resonant at Fasolt. There is more light and shade in the sometimes lyrically expressive part than we are given here, and we don’t really feel sympathy for the lovelorn giant as we should. The scene between the giants and Wotan lacks a degree of involvement here, just where Wagner’s music also tends to sag. A singer like Martti Talvela (for Karajan) manages to lift the drama where it is needed. The role of Loge has tended to attract two quite distinct kinds of singer: either a character tenor (like Gerhard Stolze for Karajan) or a heldentenor taking a step back from heroics (like Siegfried Jerusalem for Levine). Loge has some quite lyrical singing to do, as in his narration describing his search for one who would forswear love. For this reason Janowski casts Peter Schreier, a Mozartian tenor who also undertook Strauss roles to good effect. Svanholm was a heldentenor who was by 1958 nearing the end of his career, but he still had the lyric resources to give full measure to the part and his voice is naturally more honeyed than the sometimes thin-toned Schreier. Gerhard Stolze sings Mime in Siegfried for both Solti and Karajan, and although he is better for Karajan he is definitely something of an acquired taste. His flickering almost Sprechstimme delivery is involving enough in the character role of Mime but misses totally the lyrical intensity of Loge for Karajan; and in the Solti Siegfried he delivers the most blood-curdling whooping sounds when Mime is directed to cackle during his scene with Siegfried. Wagner specifically asks here for a high-pitched “hi!-hi!-hi!” on top G or G-sharp, and that is exactly what Stolze does for Karajan but for Solti the sound is not only not what Wagner demands but sounds totally inauthentic. One of the adjuncts to this set comes in the form of the complete original reviews in the Gramophone, and it is interesting to note that Alec Robertson there similarly picks out this passage for adverse comment. Culshaw says that there were some passages in the Ring that he would have liked to record again, and this should most definitely have been one of them. One might wish that Decca had stuck with Paul Kuen as Mime throughout – his tenor did not lack character but had a much more secure sense of style than Stolze displays – and he is suitably woebegone in his little scene in Rheingold. Heinz Zednik (for Levine) is in the same sort of mould as Stolze, but uses his voice with a much surer sense of what is appropriate; Peter Schreier (for Janowski in Siegfried) simply lacks the pungent sense of character that one finds in his rivals; Peter Haage (for Haitink) is a bit wild. So onwards to Die Walküre. In the First Act we encounter James King as Siegmund. His performance has come in for a good deal of stick over the years by critics who compare his performance unfavourably with his live recording for Karl Böhm made at Bayreuth at around the same time. Complaints have centred around a supposed lack of commitment and intelligent shading of the text. I really don’t feel that. He produces a stream of golden tone which not only thrills by his emotional ardour but also can be refined down to a heartbreaking sense of loss. King was at the peak of his form at the time of this recording – he could sometimes be rather laid-back, as I recall from a live Turandot at Covent Garden in the late 1960s – and his reading here has to my mind more heroic ring than Reiner Goldberg (for Haitink), Gary Lakes (for Levine) or the young Siegfried Jerusalem (for Janowski). His only real rival on disc is Jon Vickers (for Karajan) who certainly delves into the words with more intelligence but has a less naturally ingratiating voice. As his sister Régine Crespin is quite simply superb, thrillingly full-toned and every inch the heroic figure she should be. Gundula Janowitz (for Karajan) is as beautiful as always, but she simply does not convince the listener that she could drug Hunding in order to elope with her twin brother – this Sieglinde would simply not have had the nerve – or that she could imply to his face that her husband is a coward. Jessye Norman (for both Levine and Janowski) most certainly could, but one gets the feeling that she would have done a good deal more than simply imply anything. The only soprano in a studio recording who comes close to rivalling Crespin is Cheryl Studer (for Haitink) but she is sabotaged by Goldberg’s inexpressive Siegmund and Haitink’s less than ecstatically impassioned conducting. Crespin also appears as Brünnhilde in the Karajan set (for Die Walküre only) and this can only be regarded as a serious mistake. She sounds seriously over-strained throughout, and her final address to Wotan gives us a distressing picture of a voice pushed beyond its limits. It is no surprise that Karajan turned to Helga Dernesch for the rest of the cycle (after Christa Ludwig refused a request from him), although she too begins to show signs of wear in places. In hindsight it is clear to see that she would in a few years return to the mezzo repertoire in which she excelled. Karajan’s experiments with casting were notorious, and as we will see with Siegfried his habit of pushing singers beyond their comfort zones could be disastrous. There is not the slightest danger of disaster with Birgit Nilsson’s Brünnhilde here. For a period of twenty years and more she was the singer of the role in opera houses throughout the world, and her voice, steady as a rock and never showing the slightest sense of strain, remains a miracle to hear, always strong and firm and never ever making an ugly sound. None of the singers of the role on the other sets comes close to matching her. Jeanine Altmeier (for Janowski) gives us a smallish voice nicely produced and steady but lacking in punch; Hildegard Behrens (for Levine) is intelligent and hard-working but lacks the sheer sense of glamour that one finds with Nilsson; and Eva Marton (for Haitink) is disastrous, at once loud and unsteady. There have been worse Brünnhildes to be found on the stages of the world’s opera houses, but Marton is pretty low down the league – which is topped unassailably by the marvellous Nilsson, whose voice has never been matched and is captured here in its prime and under ideal circumstances. There are those who prefer her live recording with Karl Böhm – who has many of the same singers as Solti – for its supposedly greater nuances, but the Bayreuth balance for Böhm cannot begin to match the carefully shaded studio recording that Culshaw and his engineers give us here. The Valkyries in the final Act are a mixed bunch, as always, including some voices of greater strength than others. Even so, rarely can we have heard a more stellar line-up than here with two future world-class Brünnhildes (Berit Lindholm and Helga Dernesch), and the incomparable Brigitte Fassbaender and Helen Watts among the participants. The other four don’t let them down, either. Gottlob Frick is a good Hunding, properly challenging in the Second Act and with rock-solid tone; and his offstage horn – about which Culshaw is so amusing in Ring Resounding – was worth all the trouble the producers went to in recruiting a proper Alpine horn – unfortunately accompanied by its amateur player to the sessions – it proved difficult to persuade him to hand the instrument over. No other set manages to get anything like the remarkable sound we have here. In Siegfried we encounter Wolfgang Windgassen, who has also come in for a share of criticism over the years. Culshaw himself admits that he was not the first choice for the part; indeed he was a last-minute substitute when Ernst Kozub, who had originally been contracted for the role, proved inadequate. Culshaw suppresses Kozub’s name in his book, and indeed deliberately misleads the reader by implying that Kozub was previously unknown to him. He had in fact already appeared (as Melot) in Culshaw’s production of Tristan und Isolde conducted by Solti. It might well be that Kozub could have sued for libel given the unflattering depiction of his inadequacies given in the book, but given what one has heard of his voice elsewhere one cannot imagine that he would ever have been more than an adequate Siegfried. Windgassen could be lazy, and although I never saw him on stage I have been told that he could also be slapdash and resort to deliberately ‘sending up’ moments like “Das ist kein Mann!”. Although he does not have a supremely heroic voice like Lauritz Melchior in the 1930s – he is sometimes slightly soft-centred – he is excellent in the forging song and rises superbly to the challenges both here and in Götterdämmerung. René Kollo (for Janowski) is nothing like as pleasant to listen to, and Reiner Goldberg (for Levine) is even worse. The only real challenger to Windgassen is Siegfried Jerusalem (for Haitink) who also does not have a naturally heroic voice but manages what he does have well and impresses one as being heroic even when he isn’t. Helge Brilioth (for Karajan in Götterdämmerung) is good – his performing career in the 1970s was short, although at his best he was convincingly full-voiced – but Jess Thomas (for Karajan in Siegfried) is unfortunately another example of Karajan simply pushing a good singer too far too fast. Thomas was a superb Lohengrin and I remember him with pleasure in Meistersinger and Tristan at Covent Garden. Unfortunately the forging scene simply demands too much of what was essentially a strong lyric voice. At about the same time Alberto Remedios at Sadler’s Wells was managing to sing the role with a similar sort of voice; but he was helped by Goodall’s sympathetic and less forceful conducting. Even then his voice did not survive the strain unscathed. In the Second Act of Siegfried we encounter the Waldvogel of Joan Sutherland, which was described at the time as “a piece of ritzy casting”. That said, it was not absurd; she had indeed sung the role a number of times in her earlier career at Covent Garden. One finds it hard to imagine a voice more perfectly suited to the small role. Certainly none of her rivals on disc, even the delectable Kathleen Battle for Levine, really match the effect of a voice like Sutherland’s in this music. Complaints about her unclear diction are really not that important here. Kurt Böhme returns as Fafner, as louring a presence as in Das Rheingold, and the efforts made by the producers to achieve a suitable cavernous tone for the dragon pay dividends in spades. None of the other recordings achieve the same sort of baleful atmosphere. One’s only reservations might concern the roars during the fight with Siegfried, which are indeed called for by Wagner but which are here just a bit too insistent even though their presence is dramatically thrilling. In the Prologue to Götterdämmerung we meet a very good trio of Norns, with Helen Watts superbly cavernous as the First Norn, Grace Hoffman (another Viennese regular in mezzo roles) as a nicely rounded Second and Anita Välkki (who sang Brünnhilde in Solti’s first London Walküre) as a rather squally Third. Most of the studio sets do themselves proud with the casting here. Haitink has a starry line-up consisting of Jard van Nes, Anne-Sofie von Otter and Jane Eaglen; Levine has Helga Dernesch, Tatiana Troyanos and the slightly less impressive Andrea Gruber; Karajan has Lili Chookasian, Christa Ludwig (who doubles as Waltraute, and is the best of all) and the young Caterina Ligendza; and only Janowski has a somewhat less impressive team in Anne Gjevang, Daphne Evangelatos and Ruth Falcon. Culshaw places the voices of the Norns in a bleached chilly acoustic, which could have been dangerous with a less accomplished team of singers but which here brings just the right sort of doom-laden atmosphere. One cannot possibly complain either about the blatantly electronic engineering of Windgassen’s voice when disguised as Gunther at the end of the First Act. It realises just the right sense of strange alienation without being in any way unmusical. At the beginning of the First Act proper we are at once introduced to Fischer-Dieskau’s Gunther, a controversial piece of casting but one which is fully justified by a stunning performance – more convincingly Wagnerian in tone than his Rheingold Wotan for Karajan, for example. With intelligent pointing of words he realises the Gibichung ruler as a truly tragic figure in his own right, and only his unfortunate lapse into a sort of Wagnerian ‘bark’ at the end of his Third Act phrase “Angst und Unheil greife dich immer!” ever suggests any sense of strain. None of his rivals in the other studio sets comes close to touching him. By his side Claire Watson seems a somewhat pallid Gutrune – Gundula Janowitz for Karajan is more feminine, and Cheryl Studer for Levine more passionate – but she gets the right sense of fear into her solo at the beginning of the final scene. Gottlob Frick is simply superb as Hagen, baleful and strong even in the highest register and black as night in his watch. By comparison Matti Salminen (for Levine and Janowski) is suitably dark but somewhat lowering and bullish in tone, John Tomlinson (for Haitink) is blackness itself but less villainous in sound, and Hans Ridderbusch (for Karajan) too soft-grained. Here, too, Decca again went to great lengths to get the right sort of sound from the Stierhorns, specially manufactured for the recording, and their discords at the beginning of the muster of the vassals rivet the attention. Christa Ludwig as Waltraute (for both Solti and Karajan) is one of those assumptions of a role that simply defeats all possible challenges. She is by turns fearful, haunted and demanding, and none of her rivals in studio recordings come near to matching her; both Ortrun Wenkel (for Janowski) and Hanna Schwarz (for Levine) have unacceptably unsteady passages, and Marjana Lipovšek (for Haitink) although intelligent simply lacks the richness of voice needed for the lower passages. In the final Act we encounter our new trio of Rhinemaidens, and although the strength of the young (and, at that stage of her career, rock-steady) voice of Gwyneth Jones can sometimes overpower her somewhat smaller-voiced sisters, they generate plenty of excitement and blend well in ensemble. The choir, trained by Wilhelm Pitz, is excellent; but one does wish that Solti had obeyed Wagner’s specific instructions when he sometimes asks only for “one voice” or “two voices” especially when the vassals are interrogating Siegfried during his narration. To have the questions delivered by a full body of choral voices introduces an air of artificiality into the proceedings which Wagner clearly wished to avoid and which sounds unnatural. Furtwängler in his dreadfully recorded (and cut) La Scala performance gets it right. So here we are, well over 4000 words into this review, and I have not even yet mentioned the conducting except in passing. It has to be admitted that Solti was an excitable conductor, and that in the theatre he sometimes allowed the emotion of the moment to lead him into an over-emphasis that could unbalance the conception of the work as a whole. However, for listening on record, without the visual element, this would seem to be a fault on the right side. Goodall, for example, who could pace the whole of the Ring as a single structure, frequently paid the price with passages that seem slightly pedestrian or even pallid. Janowski is an excellent technician, but he lacks Solti’s ability to work up Wagner’s frequent climaxes with all the energy that they demand. Haitink, who can rise to these occasions in live performance, allows the tension to slip in the studio. Levine has the same sort of energy as Solti, but sometimes he allows this to lead him into sudden unconvincing switches and accelerations of tempo – the climax of the prelude to Act Two of Siegfried is a good example of this. Karajan’s set is peculiar in this regard; when he recorded Walküre (the first of his cycle to be issued) he seemed to be looking for a ‘chamber music’ feel in the score which simply fails at times to rise to the climaxes at all – Rheingold suffers in the same way – but by the time he came to Götterdämmerung he had reverted to the more rounded and saturated sound that mature Wagner needs. For that reason, and because of the changes of casting in all the major roles between episodes, his Ring seems the least unified of all. Solti’s contribution to this set seems to me to have been persistently under-rated even by critics who recognise the superlative casting. He clarifies the textures every bit as much as Karajan – and with better playing, for example before Donner’s “Heda! hedo!”. The only important orchestral line in the whole score which is underplayed is the superb rising trumpet line which follows immediately after Brünnhilde’s “Helle Wehr!” in Act Two of Götterdämmerung, which is almost smothered by Nilsson’s supremely dramatic performance. Karajan is similarly reluctant to ‘bring out’ this passage; Goodall gets it right in his live performance at English National Opera. In a score the length of the Ring, to find only one brief passage where the balance is arguably awry is an awesome achievement. None of the many live performances on CD can claim anything like as much. The playing of the Vienna Philharmonic is superb; even the sometimes acidic tone of the oboes is acceptably characterful. Culshaw in his book says that the orchestra purchased a new set of timpani especially for the recording, and they have all the punchiness that one could possibly want. The Viennese horn players have a marvellous sense of nobility which makes the entry of the Wagner tubas – played by the second set of hornists – at the beginning of the second scene of Rheingold something very special; this was the point at which the original LP side division occurred, but the splicing of the two presumably separate recording tapes is sensitively done here. The string playing has a coruscating quality that quite outclasses Karajan’s Berlin players, notably in the divided passage that begins Donner’s call to the thunder towards the end of Rheingold. At the same time they are masters of the impressionist sweeps that Wagner introduced into orchestral writing in the Magic Fire Music – and at many other points in the score – and which lend the music much of its distinctive colour. Nobody is going to record a studio Ring without a world-class orchestra and the other sets made in Berlin, Dresden, Munich and New York all boast first-rate playing. The Viennese have a tone that is saturated in the Wagner sound and at the time of these sessions had a tradition stretching back some eighty or more years to conductors like Richter and Möttl, who had worked with Wagner himself on the Ring at the first Bayreuth performances. Some of the older players here will therefore have performed alongside colleagues who had a first-hand connection to the composer himself. It is not surprising that the Solti Ring was one of the first operatic sets issued on CD by Decca after 1983. However the initial releases were somewhat disappointing in many ways. At that stage of the development of CD technology it was not possible to allow any of the Acts of the tetralogy except Act One of Die Walküre to be heard without interruption; the sound, especially in Siegfried, was a bit boomy and lacked the sheer excitement of the original LP resonance. The newly designed covers were uninspired and dispiriting. In 1997 Decca re-mastered the recordings, to their considerable benefit, restored the magnificently atmospheric original cover designs, and rationalised the CD layout to eliminate many of the undesirable mid-Act breaks: incidentally reducing Rheingold from three to two CDs. This reissue not only re-masters the original tapes again, but also restores a quaver in Rheingold that was accidentally missed out in the original editing. I must admit that I had never noticed its absence. The side-breaks here remain as in 1997, which is unfortunate in Siegfried where the first break actually comes in mid-note: Windgassen’s phrase “Wo birgst du dich?” ends in mid-air, and the fp string tremolo which should underpin the final word in fact begins the second disc. It may have actually been recorded that way – the same break was made on the original LPs – but it should have been possible in this re-mastering to restore what Wagner actually wrote and move the break back to a silent bar some time earlier. The break between the last two discs comes after Wotan’s “Weisst du, was Wotan will?” where Wagner’s score indicates Langes Schweigen; but this is a dramatic pause – the supposedly all-wise Erda is unable to answer his question – and a better break could have been made just after Siegfried’s entrance some minutes later, which is where the Goodall set makes it. Otherwise the breaks between the discs, where they are unavoidable, are made with sensitivity and taste. I will return to this matter later when considering the Blu-Ray Audio version. The second volume of this set brings a full new edition of John Culshaw’s book Ring Resounding, long out of print, but one must admit that the format of the book in two columns on a full-side LP-style page does not make for ease of reading. The text remains as in the original, complete with Culshaw’s reticence about Ernst Kozub and with his disparaging remarks about both the Hans Knappertsbusch 1951 live Bayreuth Götterdämmerung and the complete 1955 Joseph Keilberth recording from the same venue remaining – both have subsequently become available on CD and the Keilberth has garnered ecstatic critical reviews. The only alteration is the omission of the schedule showing the timings and layout of the original LP sides, which is no longer of any relevance. Some of the illustrations from the original book are no longer here either, and I miss the picture of Hagen’s alpine horn. Culshaw’s comments about the future of opera recording make very interesting reading; he anticipates the arrival of flat-screen stereophonic television and DVD performances, even if he was optimistic about the time-scale over which these innovations might arrive. We still await the fulfilment of his suggestion that the home viewer might be able to ‘produce’ the operas to suit his own pleasure. Culshaw would certainly not have been pleased by modern trends in production in the opera house, and his expectation of the use of film to provide background scenery for productions of the Ring remains unrealised. However he is always an interesting writer – he had once hoped to make a career as a novelist – and the book remains both readable and enjoyable. Also readable and enjoyable is Deryck Cooke’s masterly analysis of the music of the cycle, contained in the third volume of this set. Originally given in full when the LPs were issued, the CD release abridged the printed text – the spoken text of course remained intact – which reduced the CD booklet to manageable proportions but robbed the reader of the chance to follow his arguments in detail. Cooke went on to produce a much more elaborate analysis not only of the music but also of the text, but we were denied three-quarters of his projected book by his death. The torso was published as I saw the world end and remains one of the most valuable pieces of writing on Wagner’s Ring. This makes the present analysis all the more indispensable and valuable. Some of his conclusions on the way in which Wagner constructed his motifs – which are illustrated not only with excerpts from the Solti recording but also with some specially recorded examples – are perhaps a mite contentious. Is the motif of ‘resentment’ really built up from the harmonies of the ‘ring’ motif in the rather mechanical way he describes? Be that as it may his classification of the motifs into ‘families’ which are linked by specific harmonic and melodic configurations is a valuable antidote to the prevalent habit of labelling the themes and leaving them to stand alone that was long the custom of earlier critics and analysts such as Walzogen and Newman. This set also gives us Culshaw’s valuable essays on the individual operas which were originally written for the LP issues, and a brief note by Humphrey Carpenter on the television documentary The Golden Ring which was recorded during the second set of Götterdämmerung sessions. The television documentary also forms part of the package, and confirms one’s impressions of Solti’s dynamic conducting style. Has any conductor, except perhaps Bernstein, ever worked so hard and energetically at getting exactly the sense of excitement he wanted? It also stands as testimony to the impassioned commitment of Windgassen and Frick who really throw themselves into the dramatic implications of what they are singing. Nilsson is a tower of strength and it comes almost as a relief when she breaks down into a fit of giggles as the recording team introduce a live horse into the final session of her Immolation scene. The sound on the video recording is a bit brash by comparison with the re-mastered sound on the CDs themselves, but the sense of excitement and passion remains for us to enjoy. Even the rather grainy black-and-white images and slightly sycophantic commentary by Humphrey Burton himself add to the sense of period occasion. For those who would like to hear the recording in better quality sound without the need to go to the original discs themselves, the video also includes surround-sound versions of the music included in the original television documentary. The re-mastering of the 1997 digital tapes – the original analogues, we are advised, have unavoidably deteriorated over the years despite the best attempts to preserve them – is extremely well done. We are told that an attempt has been made to delete extraneous background noises, although the clatter of something being dropped (?) during Flosshilde’s seduction of Alberich in Rheingold – probably the most noticeable such sound – remains audible and presumably could not be removed. At the same time some of the internal balances in the orchestra have been improved, and one immediately notices one example of this at the very beginning of the Rheingold prelude. In the original LP issues, and in the first CD set, there was always a problem with the opening E-flat in the double basses being followed by the B-flat a fifth above in the lowest register of the bassoons. This was a problem of Wagner’s own creation, in that it is simply impossible for the bassoons to play as quietly as the double basses and there is an unfortunate tendency for the basic E-flat to be overshadowed by the fifth above it. In the 1997 reissue, and here, the E-flat is given its proper status as the bedrock on which the whole of the prelude is based, presumably by boosting the double bass sound, an excellent example of the properly musical manner in which the re-mastering has been undertaken. It should be mentioned that there was also a limited edition Japanese re-mastering issued in 2009 which was reviewed on this site by Jack Lawson (review), but it is not clear what connection that has to this new edition. We are also given a complete performance of the whole Ring on one Blu-Ray Audio disc, which gives us the whole recording without any compression and as closely as possible to the original taped sound. I am grateful to a friend who set up a number of comparative audio systems to enable me to compare these, together with copies of the original LP sets (which we played on an SME turntable using a Koetsu Urushi cartridge). The first thing that has to be said is that the sound played through the best systems – we used a Sony Vaio laptop using Corel Win DVD pro 11 playing via USB into Benchmark Dac 1, Audio Research Reference 3 and Reference 110 amplifiers and Martin LoganVantage speakers- is quite definitely an improvement on even the CDs as re-mastered here; there is a greater sense of depth and resonance, and a natural hall acoustic which sets the voices further back within this without at any point compromising the immediacy of their dramatic contributions. It makes an appreciable difference what equipment you play the disc on. Using a standard Blu-Ray set-up with a normal television receiver – we experimented with a BDP S350 via hdmi – will not get the best out of it, and listeners will need to experiment themselves with various configurations – as we did, using also a Sony BDP S350 Blu-Ray player optically linked to Benchmark Dac 1 – to decide what produces the optimum results. The notes with the set emphasise the continuity that is possible on Blu-Ray Audio without breaks between CDs, and the joins are well managed with one important exception. That comes with the CD change between discs 1 and 2 of Siegfried (between sides 2 and 3 of the original LPs), to which I have already referred. One would have expected here the engineers to have stitched back together the last note of Siegfried’s vocal line from the end of the first passage with the fp chord which begins the second; this can be done, as Decca themselves demonstrated with a similar passage in their CD reissue of the Dorati recording of Strauss’s Aegyptische Helena where the break between sides 1 and 2 of the original LPs was re-assembled, or as their fellow Universal company DG did between LP sides 5 and 6 of their Pfitzner Palestrina. Instead, and with incredible lack of awareness, they have inserted a pause of a couple of seconds right in the middle of a supposedly continuous passage. The German company responsible for the sub-contracted Blu-Ray transfer make great claims for their technical engineering work on their website. Did their engineers even look at Wagner’s score at this point? This is quite simply a disastrous example of spoiling a ship for a ha’p’orth of tar. I do not know whether Decca propose at some future date to release this Blu-Ray version as a separate item, or to make it available for lossless download; but if they do, this is a matter that requires addressing and correcting urgently. We were puzzled by references in some online audiophile reviews to the fact that Rheingold is alleged in some quarters to have been transferred sharp in the CD reissue – that is, at a higher pitch than indicated in the score. Comparison with the LP issue showed no such transposition. We can only assume that the critics in question were not aware of the fact that the Vienna Philharmonic have always traditionally played at a pitch of A=448 or thereabouts, as opposed to the more normal pitch of A=440. This is therefore one point at which the engineers cannot be accused of any underhand practice; they simply reflected the actual sound produced by the orchestra. Perfect pitch can be a curse as well as a blessing. Other critics have expressed a preference for the sound in the original CD issue as opposed to the 1997 re-mastering. This is a matter of personal taste. We both preferred the clarity of the re-mastered recording. This more closely reflected the superb sound of the original LPs. In any event the original CD issues suffer far more severely from unmusical breaks during Acts between the CDs: there are two breaks in Rheingold, and also breaks in Act Three of Walküre and both Acts Two and Three of Götterdämmerung. This configuration reflects the original LP layout which the 1997 reissues and this further re-mastering avoid. Yet another disc in this luxury set gives us Solti’s recording of the original chamber version of the Siegfried Idyll. This was originally intended as a fill-up for his reading of the Bruckner Seventh Symphony but later included in Decca’s first issue of the complete cycle in an LP box. Culshaw remembers the session, completed in the final stages of the Walküre recording, as “pure enchantment”. This exactly describes the beautiful playing of members of the VPO even though, as Culshaw describes in Ring Resounding, the session actually caused a near-breakdown of relations between the recording team and the orchestra. 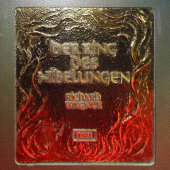 Another pendant to the Ring cycle, the little Kinderkatechismus which Wagner wrote for Cosima after the completion of the cycle and which quotes from the final bars of Götterdämmerung, was recorded for inclusion in the first LP box of the complete cycle but has never subsequently appeared on CD. It is a charming miniature which deserves to be better known, even if the cloying sentimentality of the words might grate with sensitive ears. To fill up the CD we are given a series of recordings of Wagner snippets which Solti made with the VPO during the same period. Here perhaps some of the accusations about Solti’s hard driving might be regarded as justified. He enjoys the big tune during the opening of the Rienzi overture, but the brass-saturated final sections have a brashness that while exciting is harsh. The Flying Dutchman overture is simply too fast and over-driven. An interesting comparison may be made here with Solti’s comparatively under-characterised reading which begins his complete recording in Chicago some fifteen years later. There the sound especially from the brass is more rounded. In his complete Tannhäuser recording, also with the VPO, Solti linked the Overture and the Venusberg music as Wagner himself did in his later performances. Here we are given the two movements independently. This enables us to appreciate Solti’s noble recapitulation of the Pilgrim’s march at the end of the overture. It’s a nobility that does not preclude excitement. He builds the reiterated violin figuration about which Berlioz was so scathing with a sure and steady hand, rising to a superbly judged climax. The febrile excitement of his interpretation of the Paris version of the Venusberg music does not have the emotional intensity of his reading in the complete set. The choral passages are nicely distanced, however, and the ending has the right sort of satiated glow that the music demands. The fourth volume in this set gives us not only Culshaw’s essays issued with the original LPs and a complete synopsis of the plot but also contains the complete libretti. In the 1997 issue we were given the original German together with parallel translations into both French and English. The English translations for the first three operas omitted all the stage directions, and were anonymous; that for Götterdämmerung was attributed to Lionel Salter and did contain the full stage directions. Here we have a new translation, including abridged stage directions, by Stewart Spencer which dates from 1993. It differs in many points of detail from its predecessor and is not as strictly accurate, frequently including additional words that are not in the original German, but it reads well and is literate. Fuller stage directions might have helped to identify some of Culshaw’s sound effects. There is no explanation, for example, of the rustle of metal as Mime drops the Tarnhelm at the end of the first CD. The lack of a French translation is more serious. Indeed there are no languages except German and English used anywhere in this issue. Possibly alternatives will be provided for the international market? The volume also contains a number of session photographs which so far as I am aware have not been previously published. There are some other extras, too. 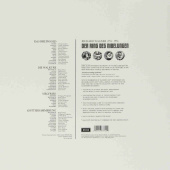 A pocket inside the jacket of the third volume contains some promotional photographs from the time of the original LP releases as well as the original advertisements and reviews from the Gramophone magazine. These might have been rendered even more valuable with the addition of the supplementary reviews that the Gramophone published at that time as ‘quarterly retrospects’ as well as Culshaw’s articles written to introduce the LPs as they were released. We are however given his final article written on the completion of the cycle as well as a retrospective published to celebrate the fiftieth anniversary of the issue of Rheingold. On a personal level I miss the original photographic artwork by Hans Wild which adorned the original LP releases and which were used for the individual box covers in 1997. On the other hand the re-packaging of this luxurious reissue is most handsome, and make this set a possession that any collector would be most proud to own. The Solti Ring has stood up well over the years and, as I hope my detailed review above has shown, it has most certainly not been out-classed by any of the later studio recordings. It is not perfect, of course – could any recording of this massive work ever hope to be? – but it has fewer weak points than any of its rivals; and the fact that it was recorded in a studio, with the possibility of ensuring note-perfect performances as well as allowing the singers to deliver passages in full voice that they would never be able to undertake without strain in the context of a live performance, means that it also stands head and shoulders above any rival for the sheer accuracy with which it reproduces Wagner’s intentions. In order to simulate the atmosphere of a theatre performance, Culshaw controversially introduced a large number of stage effects including sounds of filing and hammering of the sword, the collapse of the Gibichung hall and so on, which other recordings have largely eschewed (although the sound of the hall collapsing at the end of Götterdämmerung sounds more like a firework display in Haitink’s recording). But these effects never interfere with the quality of the music-making itself, and do add a dramatic frisson to the overall effect which compensates for the lack of the visual element. Collectors who want a complete Wagner Ring in their collection which gives us the score exactly as Wagner wrote it without any errors or slips such as are inevitable in any live performance will want this recording. And the presentation here, nearly perfect in every detail, should be most attractive to any new purchasers of the cycle. Decca showed great courage in meeting the enormous expense of making this recording in the first place, and the results fully justify their leap of faith. It remains as superb a performance now as it did when it was first issued, and in terms of sheer sound alone need fear no later rivals. In his enthusiastic review of the 2012 Decca presentation of the Solti Ring, with which I wholeheartedly agree, Paul Corfield Godfrey raises the question of its relationship to the superb Japanese re-mastered edition issued two years earlier review. I offer this appendix as a technical assessment of the re-mastering. In a nutshell, the TEAC-Esoteric set was a limited edition on the superior DSD (SACD) format; only thirty five sets were exported from Japan to the UK. It sold out worldwide 2 – 3 months after release and apparently fetches up to twice its exorbitant asking price of £500 on websites. The Decca set is marketed as a Limited Edition; it may be but mine has no number. However, it is far more sumptuous, comprehensive, and it is in English. It is also far cheaper at under £200 and a plain edition is very likely. Perhaps surprisingly, I have to say that the Decca CDs are audibly superior to the Esoteric SACDs. There is more transparency of sound along with a warmth intended to reflect the original vinyl. As such, it is very successful. I found myself unable to press the stop button; this is the acid test. It is no mean achievement. How did it happen? The first re-mastering was arguably the (German) Teldec set (Telefunken-Decca) on LPs. Although much quieter surfaces than the notorious New Malden record pressing plant in the UK, the analogue sound was anaemic and lacked dynamics. In 1997 Decca issued the Solti Ring on fourteen CDs. The transfer engineer, James Lock, had worked as a junior in the recording and knew all about the Decca Sound. In the CD notes he describes the care he took in creating the digital replica, allowing analogue hiss to remain in order to avoid robbing the music of its vivid timbre and ambience. However, in my opinion, the CDs were not adequate to portray the Wagnerian canvas. In January 2010 The Esoteric division of TEAC shipped to the UK only thirty-five sets of its re-mastered Solti Ring on 14 SACDs plus literature and bonus DVD of the BBC documentary. At this point, anything Decca had manufactured was pushed into the shade. I know from sources that the Universal Classics engineers in London (owners of today’s DECCA) were motivated by a competition to surpass the Japanese licensees. European labels play a game with the Japanese because they are envious of the sizeable Asian connoisseur audiophile and music buying market. The Europeans are also aware of the greater care and quality control demanded by this large and discriminating market. For this reason many UK buyers are paying £30 per CD to import Japanese CDs recorded in Europe by European labels. Although SHM and Blu-Spec CDs are high precision products (invariably protected by proper inner sleeves) the Japanese depend on well-preserved first generation tapes from the European studios. The European labels do not like their domestic product disclosed as sub-standard and this leads to some games. While they accept the copyright money they do like to withhold the best tapes. In this case the re-mastering engineer, Philip Siney, states that an unnamed Japanese project in 2009 were given access to the original analogue masters … but sadly they had deteriorated over forty-five years. Oh dear! Knowing this, he chose to re-master from Decca’s 1997 digital transfers created at a higher than 16-bit (CD) resolution required at the time for CD release. These tapes benefited further from the careful restoration work of his mentor, James “Jimmy” Lock, one of the original tonmeisters and proponents of “the Decca Sound”. I smiled as I read this and I wondered if re-processing the digital sound of the mediocre 1997 Decca CDs was going to approach the glory of the Vienna Philharmonic courtesy of the Japanese engineers. According to Siney, in 2012 he aimed for warmth plus transparency. Now this is hard to believe: warmth calls for a bit more bass; transparency for more brilliance. Only the most advanced engineer and best digital processors can bring forward the signal and recess the noise. The verdict: Philip Siney has achieved what he claims. He avoids a Hi-Fi sound but achieves natural transparency and inner detail combined with just the right ambience and warmth. The very best CD mastering gets very close to SACD’s extra detail and headroom, and Decca delivers it here. The 2012 set has an additional investment because, as technology progresses, you own a 24-bit master. That is a rare gesture because – as I noted in my Beatles Re-mastered review – EMI produced the 16-bit CDs and kept in reserve the higher resolution to sell again some rainy day. During the economic hardship, record collectors may like to know that the 2012 Decca set is to be issued this year in a plain set of fourteen CDs supposedly at around £100. But in 2010 Decca reissued a distinguished Bayreuth (live) Ring conducted by Karl Böhm; also on 14 CDs it boasts the very best singers of the sixties, many on the Solti Ring. Supposedly intended for Deutsche Grammophon, it is said that Karajan intervened and the then-independent Philips label issued the recording. Then as now, the Solti remains unsurpassed with the benefits of the Vienna Philharmonic, and Decca’s studio recording with enhanced, ambitious and expensive techniques. Böhm’s Rheingold, for example, opens to much coughing and noises from the pit; the theatre orchestra of Bayreuth is no match for the Viennese. However, one soon becomes aware of a dramatic intensity. This is one of the most intense and gripping Ring soundtracks which works without the spectacle. Theoretically fast tempos emerge as a brilliant insight, propelling the drama, creating what the reviewers correctly identified as the most compelling and involving readings of this work. I don’t imply a light touch, but there is an absence of any ponderous lingering. In a word it is intoxicating and thrilling in a way which modern productions strive but fail to achieve by gimmicks. What may count in the present economic downturn is the absurd bargain of around £30 for a 14-disc set of this quality. Overall, not as great as Solti, but it can communicate the essence of the Ring perhaps even better. 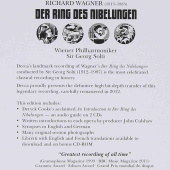 Decca’s 2012 Anniversary Ring celebrating the birth years of Wagner and Solti is probably the most precious issue in the history of the gramophone. It may be superseded by a basic set lacking the extras, including the high resolution Blu-Ray disc. First studio recording of the Ring.